G. Ecol. Cables S.r.l., since10 years on the national and international market has acquired an important position in the production of special cables (as associated of General Cavi Spa Group) and a steady presence in the world of the cables distribution. 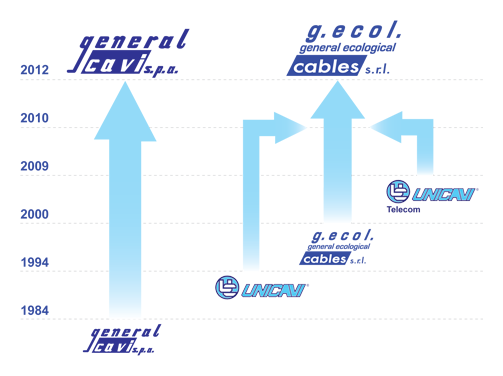 Unicavi spa was incorporated in G.Ecol Cables S.r.l. by merger from January 1, 2010. The progressive increase of the company, during the years, has brought to a strong widening of products range; suitable for several services, both in civil and industrial applications, but even more aimed at the data transmission, control and signalling, telephony and video/audio signals. The new target of G. Ecol. Cables S.r.l., is to place ourselves in to the costumers needs, as a partner, and not as a simple supplier, giving available all the products obviously, but also the “know how”, our contacts, the instruments and in particular the people. G. Ecol. Cables S.r.l. wants to be the interlocutor who gives the right solution. Unicavi is a trademark of G. Ecol. Cables S.r.l.